Definition at line 24 of file CLRenderCubicBezier.h. Creates a CubicBezier and returns the pointer. Creates a CLRenderCubicBezier and returns the pointer. Definition at line 16 of file CLRenderCubicBezier.cpp. 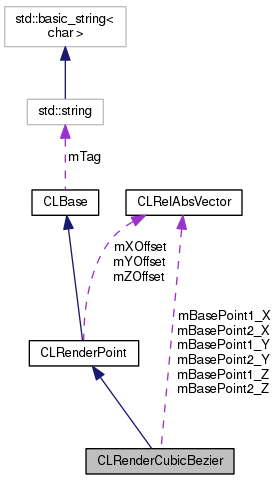 References mBasePoint1_X, mBasePoint1_Y, mBasePoint1_Z, mBasePoint2_X, mBasePoint2_Y, mBasePoint2_Z, CLRenderPoint::mXOffset, CLRenderPoint::mYOffset, and CLRenderPoint::mZOffset. Definition at line 42 of file CLRenderCubicBezier.cpp. Creates a CubicBezier with the given points and returns the pointer. Definition at line 29 of file CLRenderCubicBezier.cpp. Definition at line 56 of file CLRenderCubicBezier.cpp. Definition at line 89 of file CLRenderCubicBezier.cpp. Returns the x value of the first base point of the curve (the one closer to the starting point). Definition at line 97 of file CLRenderCubicBezier.cpp. Referenced by addToPath(), CLLayoutRenderer::draw_curve(), CLLayoutRenderer::draw_polygon(), and CCopasiXML::saveRenderPoint(). Definition at line 151 of file CLRenderCubicBezier.cpp. Returns the y value of the first base point of the curve (the one closer to the starting point). Definition at line 106 of file CLRenderCubicBezier.cpp. Definition at line 160 of file CLRenderCubicBezier.cpp. Returns the z value of the first base point of the curve (the one closer to the starting point). Definition at line 115 of file CLRenderCubicBezier.cpp. 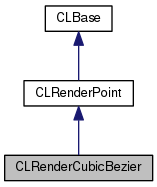 Referenced by CLLayoutRenderer::draw_curve(), CLLayoutRenderer::draw_polygon(), and CCopasiXML::saveRenderPoint(). Definition at line 169 of file CLRenderCubicBezier.cpp. Returns the x value of the second base point of the curve (the one closer to the end point). Definition at line 124 of file CLRenderCubicBezier.cpp. Definition at line 178 of file CLRenderCubicBezier.cpp. Returns the y value of the second base point of the curve (the one closer to the end point). Definition at line 133 of file CLRenderCubicBezier.cpp. Definition at line 187 of file CLRenderCubicBezier.cpp. Returns the z value of the second base point of the curve (the one closer to the end point). Definition at line 142 of file CLRenderCubicBezier.cpp. Definition at line 196 of file CLRenderCubicBezier.cpp. Definition at line 70 of file CLRenderCubicBezier.cpp. References mBasePoint1_X, mBasePoint1_Y, mBasePoint1_Z, mBasePoint2_X, mBasePoint2_Y, mBasePoint2_Z, and CLRenderPoint::operator=(). Sets the first basepoint to the given values. Definition at line 258 of file CLRenderCubicBezier.cpp. References mBasePoint1_X, mBasePoint1_Y, mBasePoint1_Z, CLRenderPoint::x(), CLRenderPoint::y(), and CLRenderPoint::z(). Sets the x value of the first base point of the curve (the one closer to the starting point). Definition at line 205 of file CLRenderCubicBezier.cpp. Sets the y value of the first base point of the curve (the one closer to the starting point). Definition at line 214 of file CLRenderCubicBezier.cpp. Sets the z value of the first base point of the curve (the one closer to the starting point). Definition at line 223 of file CLRenderCubicBezier.cpp. Sets the second basepoint to the given values. Definition at line 268 of file CLRenderCubicBezier.cpp. References mBasePoint2_X, mBasePoint2_Y, mBasePoint2_Z, CLRenderPoint::x(), CLRenderPoint::y(), and CLRenderPoint::z(). Sets the x value of the second base point of the curve (the one closer to the end point). Definition at line 232 of file CLRenderCubicBezier.cpp. Sets the y value of the second base point of the curve (the one closer to the end point). Definition at line 241 of file CLRenderCubicBezier.cpp. Sets the z value of the second base point of the curve (the one closer to the end point). Definition at line 250 of file CLRenderCubicBezier.cpp. Definition at line 278 of file CLRenderCubicBezier.cpp. References CLRenderPoint::addSBMLAttributes(), mBasePoint1_X, mBasePoint1_Y, mBasePoint1_Z, mBasePoint2_X, mBasePoint2_Y, mBasePoint2_Z, and CLRelAbsVector::toSBML(). Definition at line 27 of file CLRenderCubicBezier.h. Referenced by basePoint1_X(), CLRenderCubicBezier(), operator=(), setBasePoint1(), setBasePoint1_X(), and toSBML(). Definition at line 28 of file CLRenderCubicBezier.h. Referenced by basePoint1_Y(), CLRenderCubicBezier(), operator=(), setBasePoint1(), setBasePoint1_Y(), and toSBML(). Definition at line 29 of file CLRenderCubicBezier.h. Referenced by basePoint1_Z(), CLRenderCubicBezier(), operator=(), setBasePoint1(), setBasePoint1_Z(), and toSBML(). Definition at line 30 of file CLRenderCubicBezier.h. Referenced by basePoint2_X(), CLRenderCubicBezier(), operator=(), setBasePoint2(), setBasePoint2_X(), and toSBML(). Definition at line 31 of file CLRenderCubicBezier.h. Referenced by basePoint2_Y(), CLRenderCubicBezier(), operator=(), setBasePoint2(), setBasePoint2_Y(), and toSBML(). Definition at line 32 of file CLRenderCubicBezier.h. Referenced by basePoint2_Z(), CLRenderCubicBezier(), operator=(), setBasePoint2(), setBasePoint2_Z(), and toSBML().